There has been a worrying trend in the gaming industry lately. It seems that two particular genres of games are becoming a little overused. I’m talking of course about both the Zombie based and rhythm based/music genres. It is with a slightly raised eyebrow that I review the latest application for both iPhone and iPod Touch from developers Forever Entertainment S.A. called Frederic – Resurrection of Music Complete. This iPhone app stars the zombified remains of 19th century French composer, Frederic Chopin as he wanders the world, searching for the reason why he has been resurrected, and getting into some fun musical duels along the way. For this review, I will played this app on an iPhone 4s. If you have ever played any rhythm based iOS titles such as Tap Tap Revenge, Rock Band, or Guitar Hero before, you will be instantly comfortable with the control scheme set up in Frederic: Resurrection of Music. 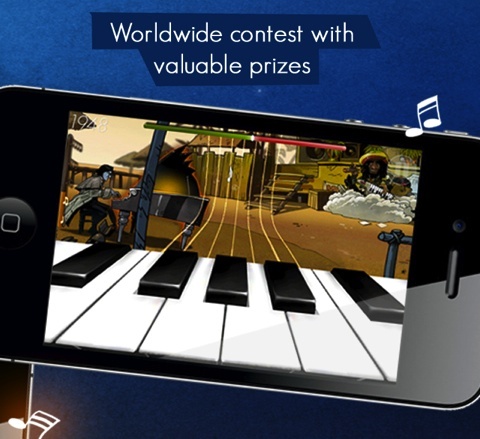 Your iPod screen will display a set of piano keys, and you simply have to tap them along with the music to score points. The music is really quite impressive in this title. The developers have included a number of Chopin’s works, and have even added their own respectful twist to some of them. This all comes together to provide an audio package that is hardly rivaled in many other iPhone apps. However, whislt the music is respectful, the application’s portrayal of its characters isn’t quite on the same level. The developers have been pretty stereotypical with depictions of various world nations. For example, The Irish character is some kind of leprechaun and Jamaica’s mascot is an over exaggerated Rastafarian with a special penchant for a certain special herb. At times these stereotypes can cross the line of decency. Im sure this isn’t what the developers wanted, but it’s the vibe I got. The story thankfully is nice and light-hearted with a goofy host of voice actors that do a decent enough job of hamming it up to ensure that the cut scenes in-between stages are still entertaining to a degree. 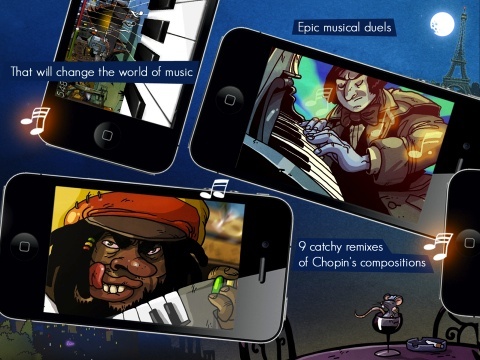 Though the meat of the game is spent flicking through virtual comic strips, Frederic: Resurrection of Music is still a fun entry into the rhythm based genre for iPhone gamers, and there is sure to be enough content to make it worth the price of $3.99. The gameplay is satisfying on your first play through, and soon becomes even more addicting on higher difficulties. You will have a lot of fun trying to get a pace on the global leaderboards. So, whilst Frederic: Resurrection of Music may not wholly be original, this iPhone app is an undead treat. AppSafari review of Frederic – Resurrection of Music Complete was written by Darius Reimm on March 5th, 2012 and categorized under App Store, Featured, Fun, Games, Music. Page viewed 4338 times, 1 so far today. Need help on using these apps? Please read the Help Page.